Back in April, I made my nephew a memory bear and a car-themed birthday cake for his second birthday. 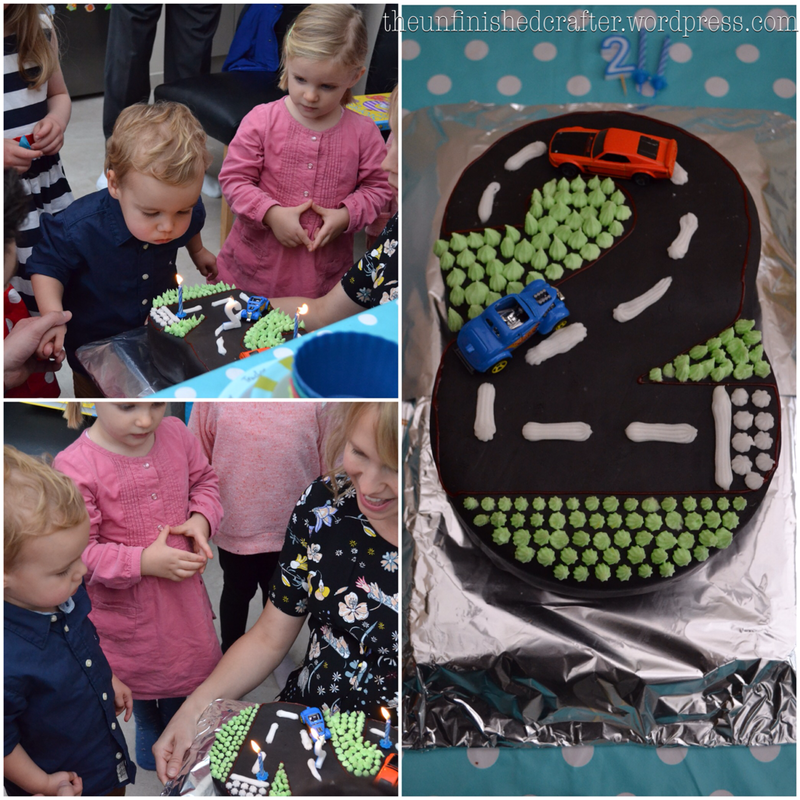 Last week, my son turned two; with him also being car-mad, I felt obliged to recreate the car cake for his birthday party at the weekend. I baked the two sponge cakes to make up the cake on Friday afternoon. However, when I cut into the first one, it was still raw inside. So, at 9pm the night before the party I had to start again, sending my husband out into the dark and cold for more butter. (A week of baking disasters, if you saw my last blog post.) This also left me in the slight predicament on Saturday morning of having a cake to ice whilst looking after a two-year old (my husband had to work). Fortunately, my Mum came to the rescue and took over childcare, leaving me free to ice the cake. Two hours later, it was done. It tasted pretty good, if I do say so myself. 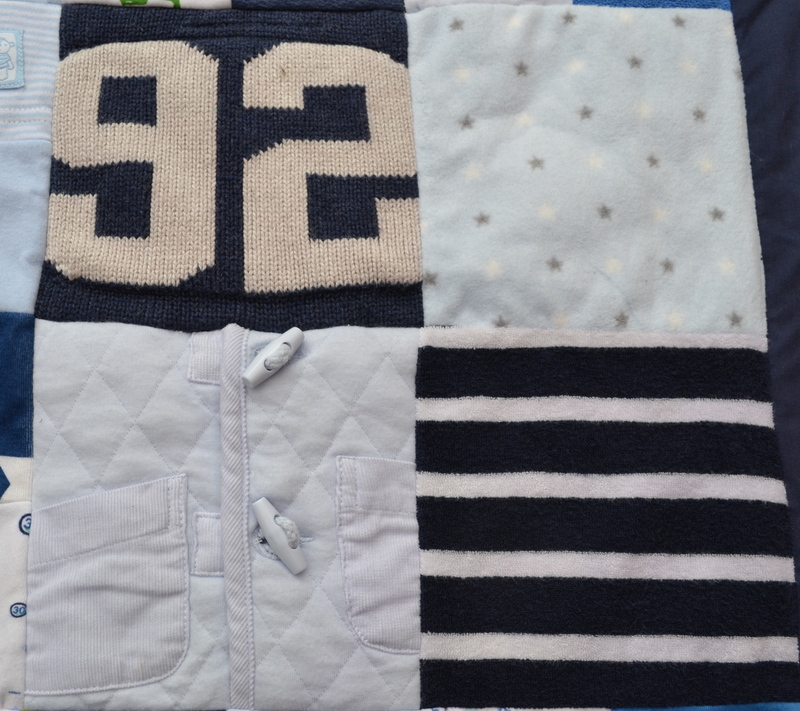 Two memory cushions, to accompany the memory quilts I made last year. My hairdresser has commissioned a memory lion made from her baby’s clothes. 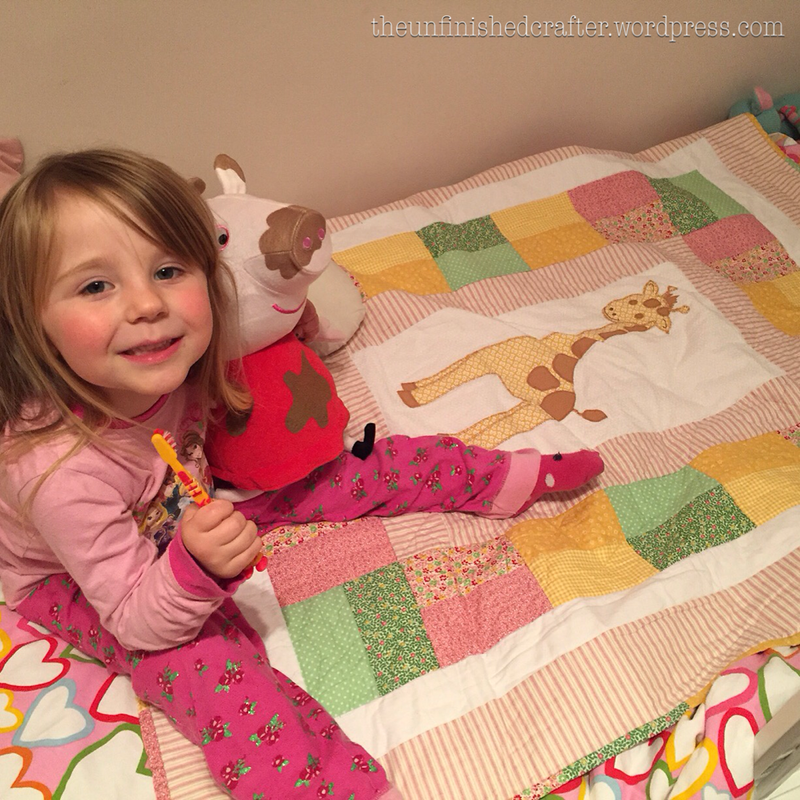 I’ve often wondered what had become of the giraffe quilt I made for my niece. 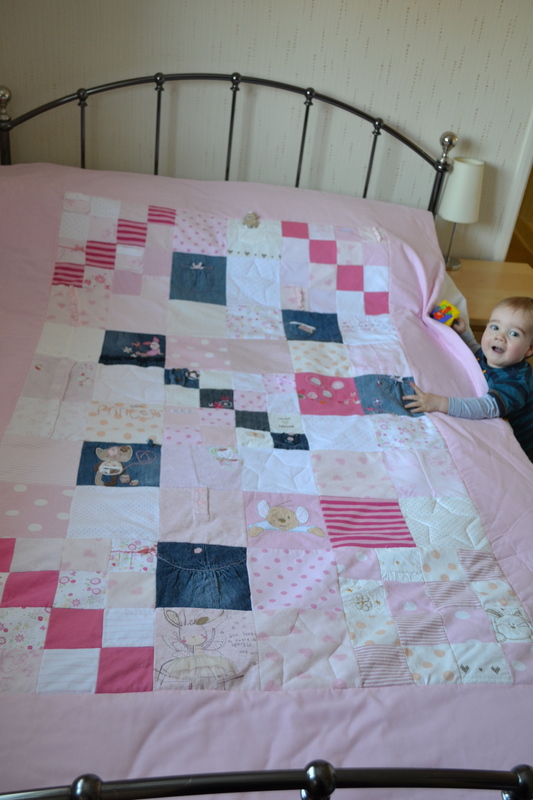 Tonight, I was delighted to receive a photo of my niece with said quilt. It’s helping her keep warm at night. That’s made my day, if not my week! I’m baaaaaaaack! 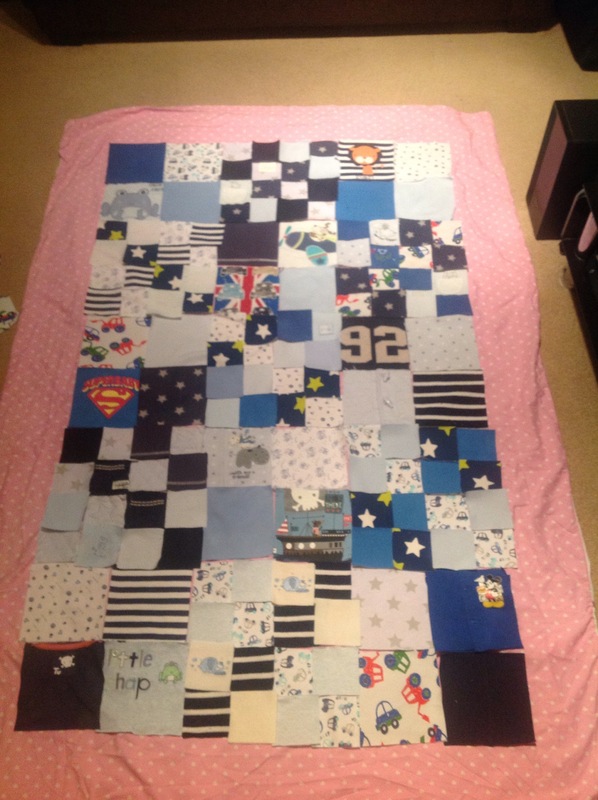 Hanging my head in shame for taking so long to complete my second memory quilt. But it’s done now and that’s what matters. Late for Christmas, but sneaking in ahead of time for the recipient’s 3rd birthday, which is on Saturday. My little helper looks very pleased with the finished result. As with my last quilt (which now belongs to the younger brother of the birthday girl), I quilted some stars on some of the plainer squares, to keep the quilt top and wadding together. 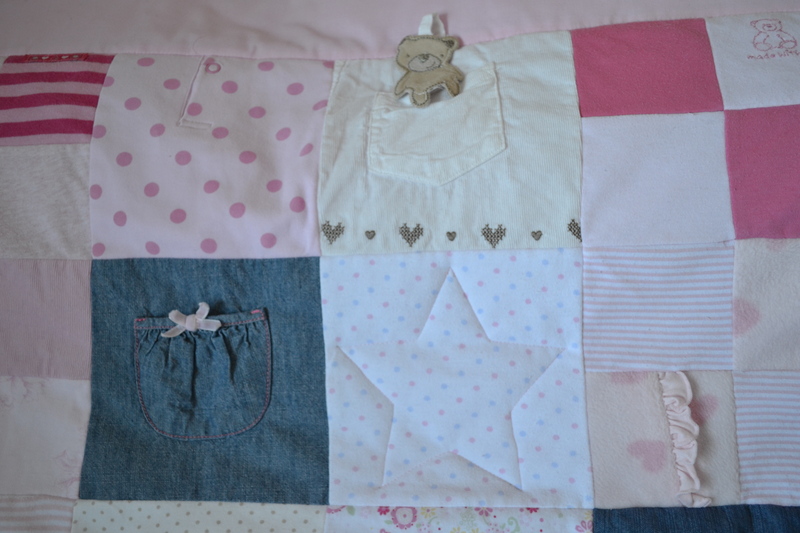 I found this quilt much more enjoyable to work with, I think it’s the girly colours and details like the bows and buttons. I’m especially pleased I managed to salvage the little teddy that can sit on or in the pocket of the white corduroy. 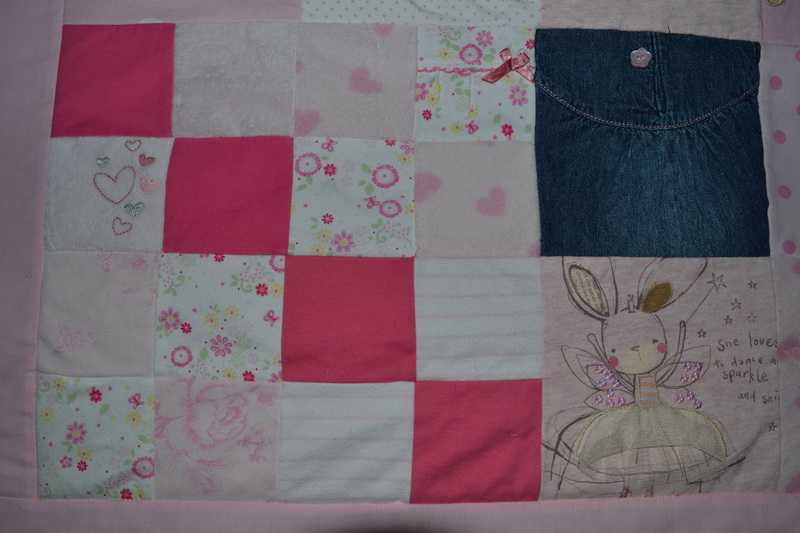 I can’t wait to see some photos of the birthday girl and her quilt. She was very jealous when her little brother got his, which was in October. So hopefully she’ll be pleased she’s got one now too. 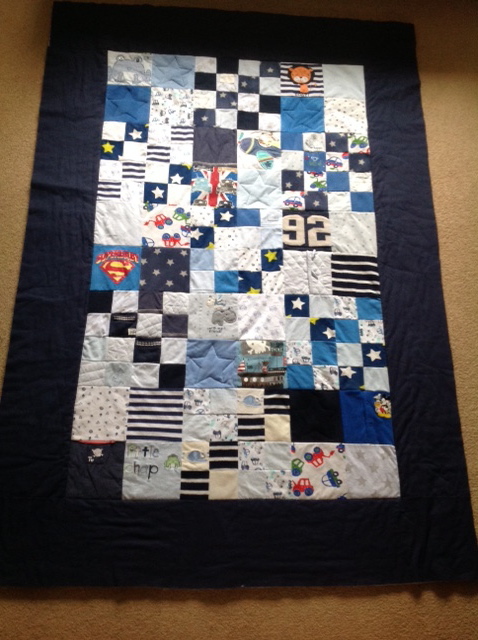 This quilt, as the other, was commissioned by a friend. I’ve given her mates/never-done-this-before-so-it’s-a-learning-curve rates. Assuming that I’d speed up a bit on this second quilt, I decided to keep track of the hours I spent on it, in order to work out whether, going forward, memory quilts are ‘worth’ doing. The scores on the doors are interesting reading. For me, anyway. So I thought I’d share. Almost 23 hours in total, and that’s probably on the conservative side, I can’t imagine I logged all my hours. Once I had deducted the cost of the materials (interfacing, wadding, backing) from my fee, my hourly rate worked out at a pitiful £3 p/h! BUT, as my husband said, I do enjoy doing it, so it’s nice to earn a little from doing something I enjoy. 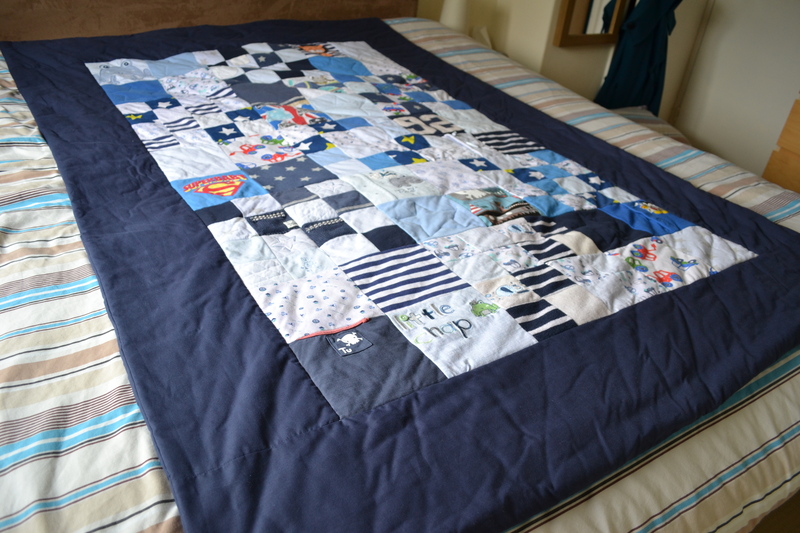 I started this quilt at the beginning of November, so it’s taken me just over 2 months to do 23 hours work on it! Depressing thought. 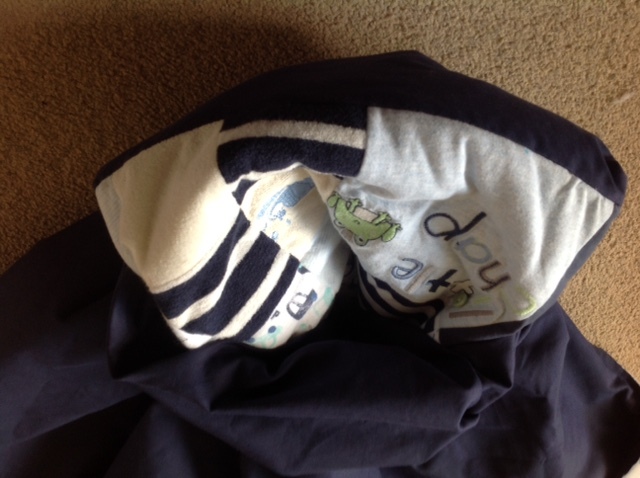 As my timings show, the cutting up of the baby clothes takes almost as long as the sewing together of them. 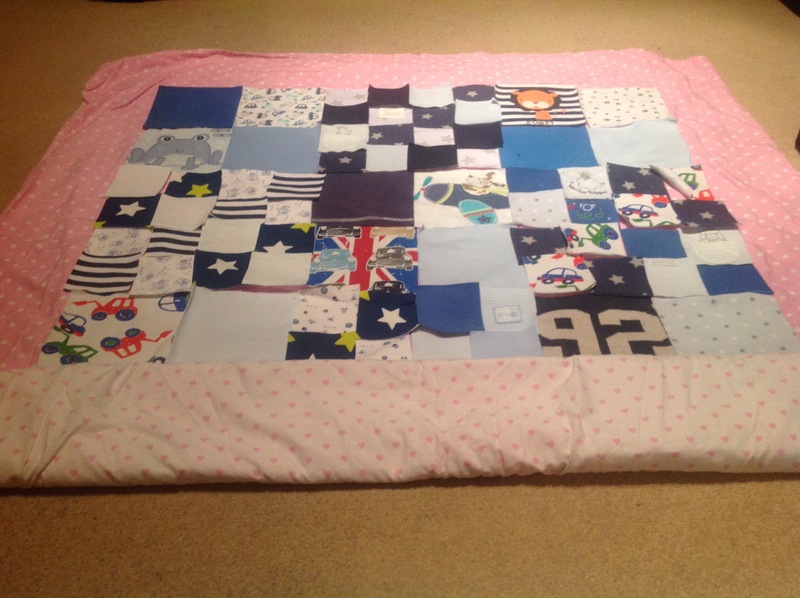 Despite this being a quilt, the quilting itself is minimal so takes little time. I’m hopeful but also doubtful that I’ll speed up on piecing. It’s quite fun moving all the squares around trying different colour combinations, like a big jigsaw puzzle. 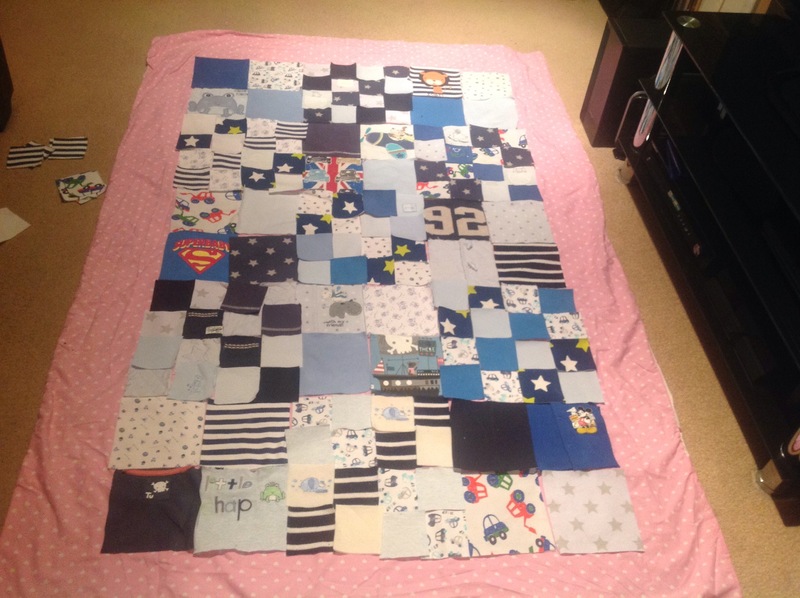 Having learnt many lessons from my first memory quilt, did I improve this time? I think so. 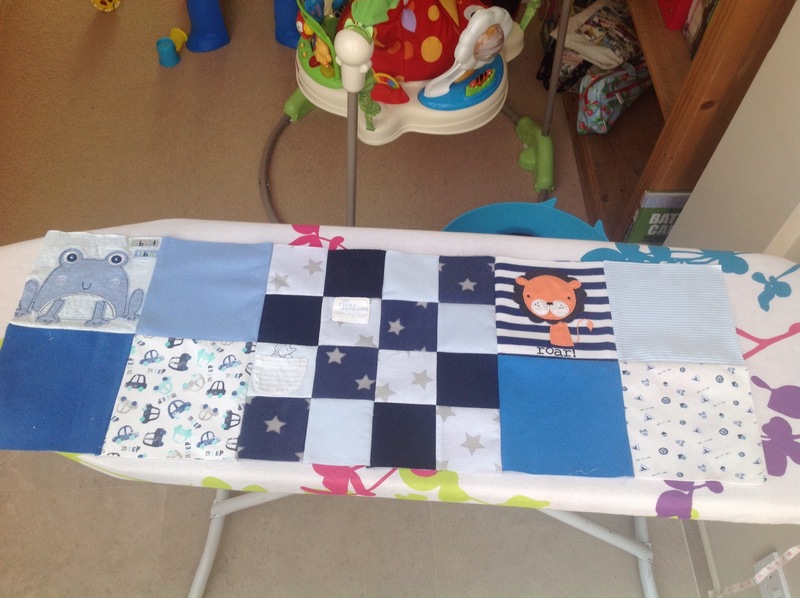 I started off much more organised with this quilt, cutting out all my interfacing first so that once I’d cut the squares from the baby clothes, I could iron the interfacing straight on. 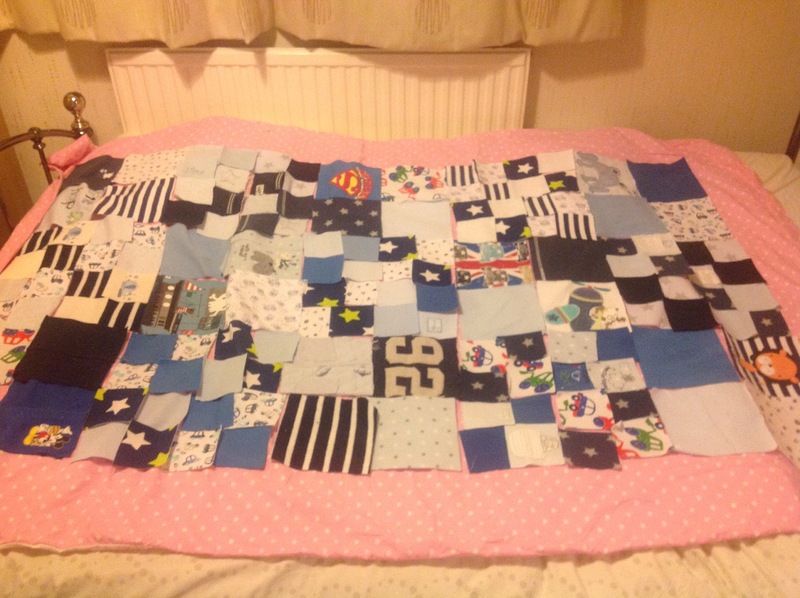 I also used fewer smaller squares than my first quilt, as the smaller squares are more fiddly and therefore more time-consuming to sew together. However, I still had to increase the number of smaller squares as they do add interest and are good to create patterns from. 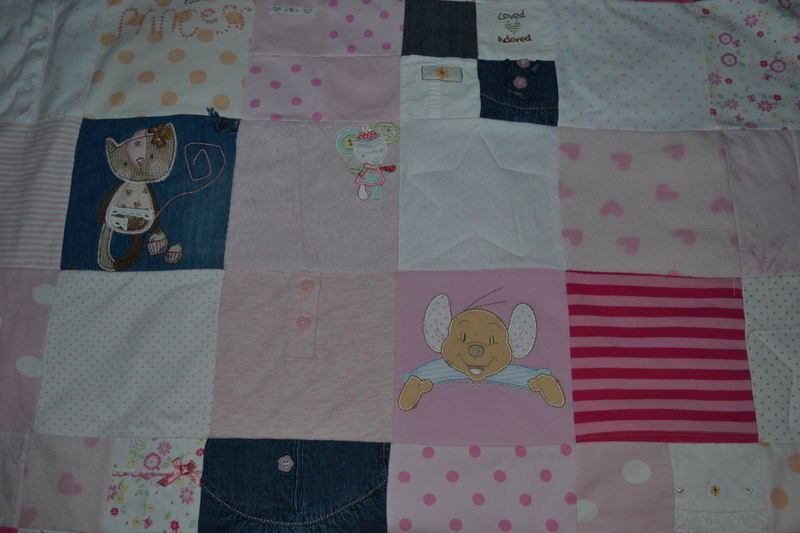 Most of the baby clothes I was given were newborn so it was hard to get big squares out of them too. I washed my backing fabric before cutting and attaching it this time (well the first batch, I may have forgotten to wash the second batch, but it worked out fine – phew …). 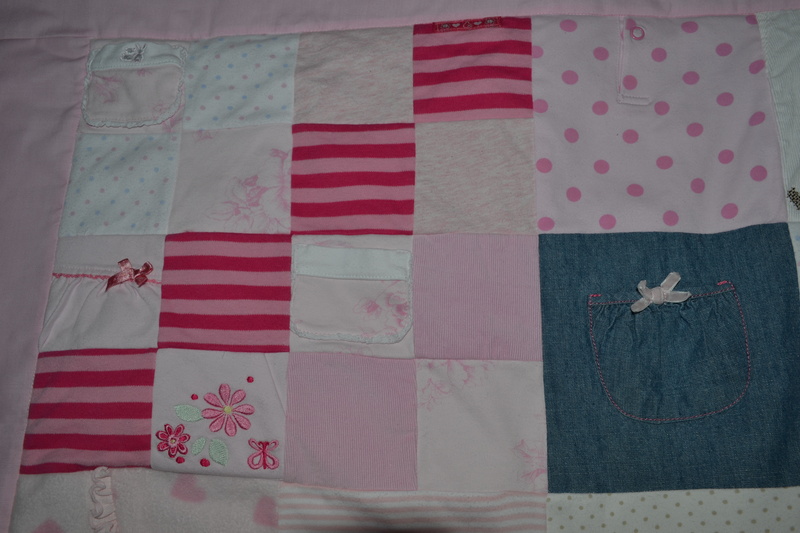 My stitching in the ditch and slipstitch both still have room for improvement but are a lot better on this quilt. 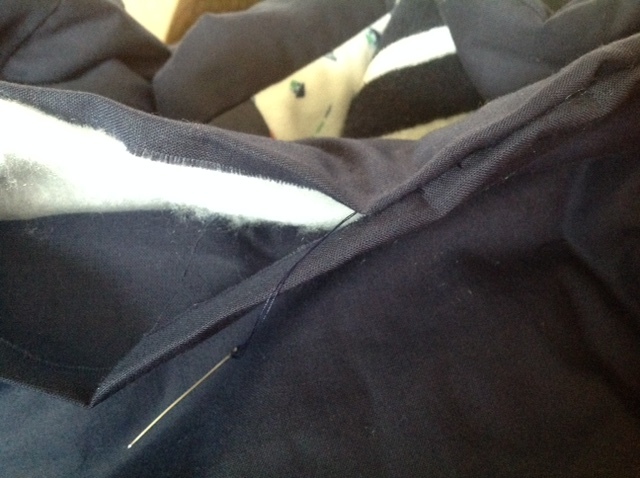 Use a denim needle when working with thicker fabrics. I must’ve broken at least 3 needles on this quilt. Wash the backing fabric first. 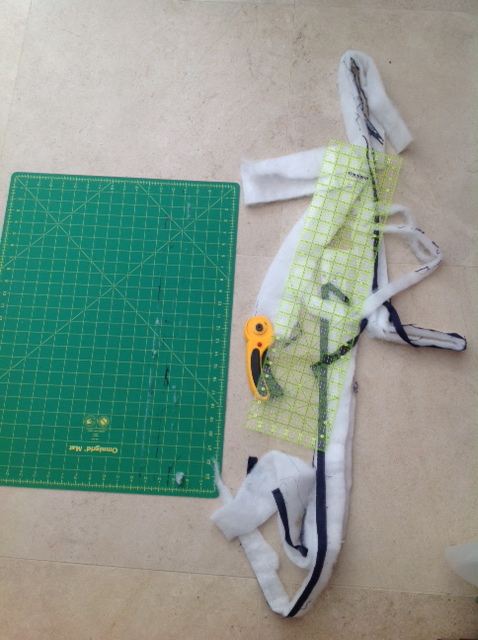 Stop and THINK before cutting up the backing fabric for the borders and backing. I ended up having to order a second lot of backing fabric when I cut the borders out first, which, because of the way I’d cut them, meant I hadn’t enough fabric left for the backing. The end result being that I didn’t have the quilt ready in time for Christmas. Try a stitch-in-the-ditch quilting foot – I think this may help me a lot. The sewing machine has been packed away and I’m off to read a book before bed. Next up, I want to do a belated review of what I made last year. Then, I’m itching to get knitting again. But, I still have many unfinished projects to complete before I can start anything new. Not that that’s stopped me before! I’ve got to live up to my name, after all. Well, not much craft got done last week. I don’t know where my evenings go. 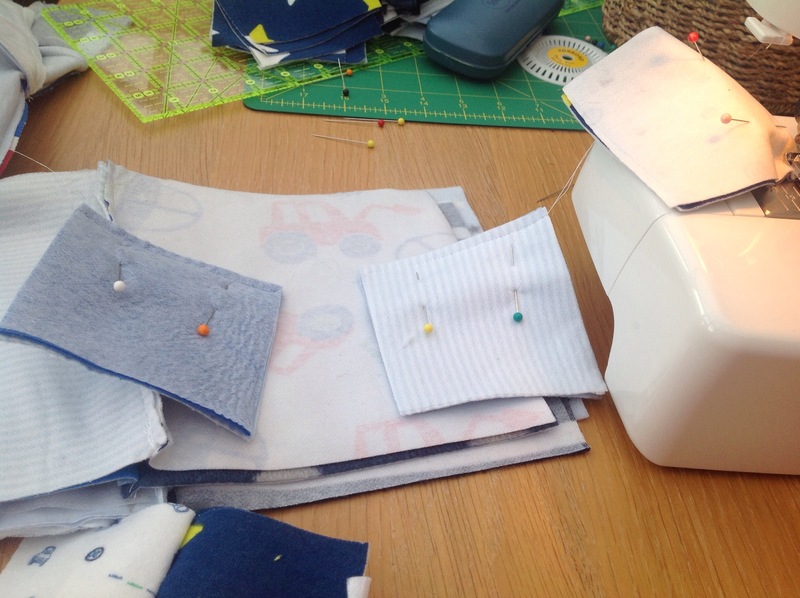 I was reading a post by Craft Schmaft yesterday about how to find sewing time. Will have to try employing some of these strategies. Anyway, I did – briefly – pick up my cross stitch on Thursday when I went to a Craft Cafe! I only found out about it on the morning via Facebook. It’s only been running for a month or so and is hosted every other Thursday evening at a local cupcake shop. You can bring your own craft or try something that’s been supplied. Last week it was card making. The Facebook page is here. I brought my Mum along with me for company; she did a bit of patchwork (by hand) while I cross stitched. And when our eyes were tired, we treated ourselves to one of the delicious cupcakes on offer. Cake and craft – a perfect combination! 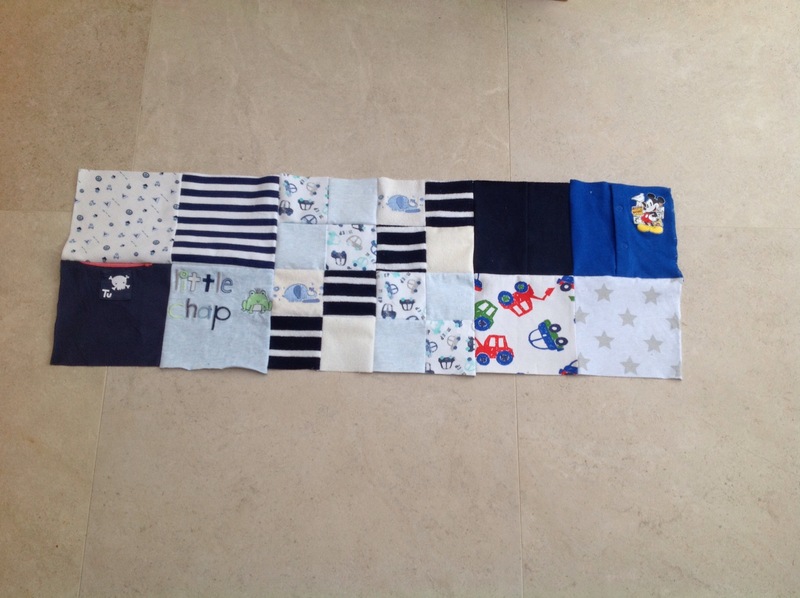 While my little man had a nap this afternoon, I got started on memory quilt number 2. This one is a girly one so I’ve been looking forward to getting started on it. I’m being much more methodical and organised this time round. Well hoping to be. 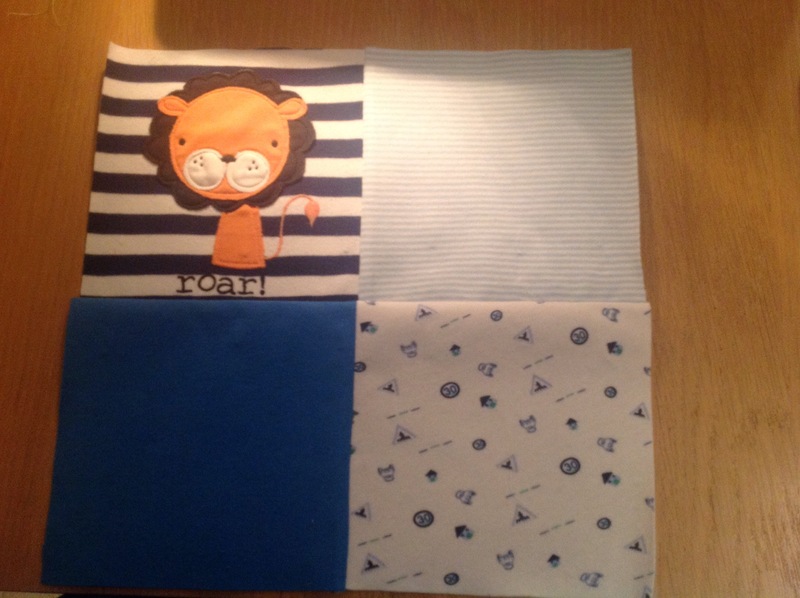 So I started by cutting out all my squares of interfacing first. 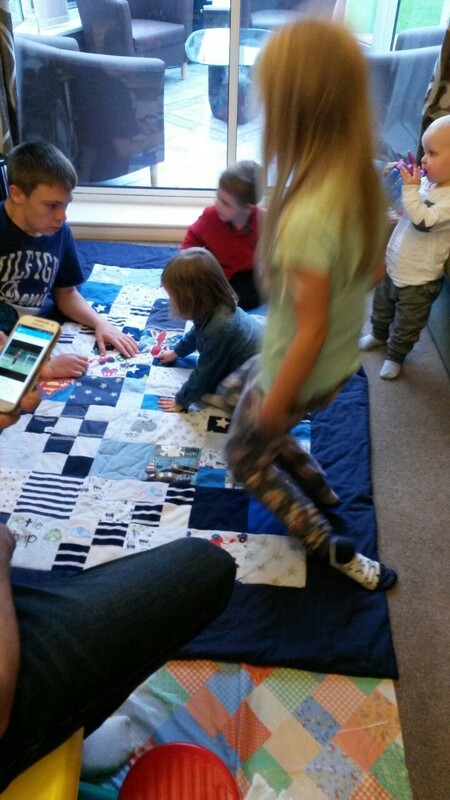 As before, this quilt will be made up of 70 6×6″ squares. But as I’ll use some smaller 3×3 squares to make up some of those 70 squares, I ended up cutting out 56 big squares and 24 small squares. I’ve cut the interfacing squares bigger than I need them. 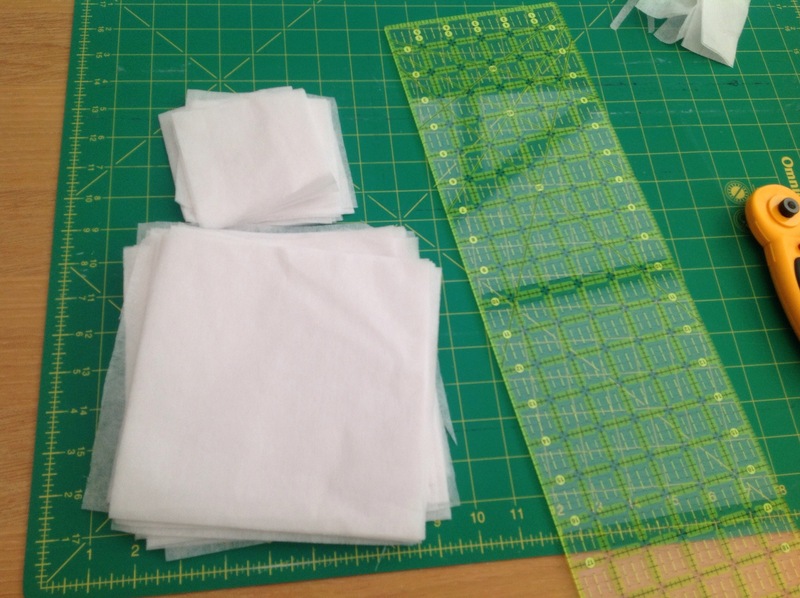 I’ve cut 7×7″ big squares and 4×4″ small squares. This is one of the lessons I learnt from the last quilt. 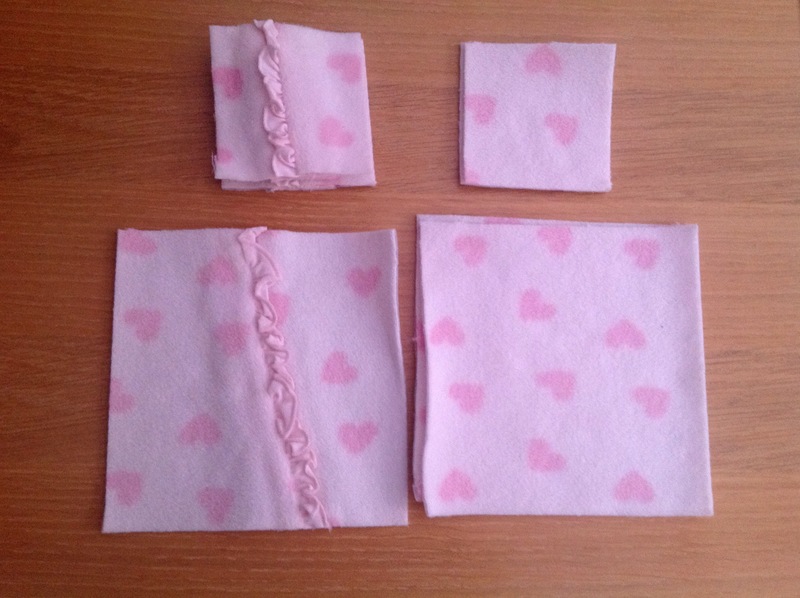 Sometimes, when I’d cut the interfacing exactly to size, it didn’t quite match up when I ironed it onto the baby clothes and cut it out. 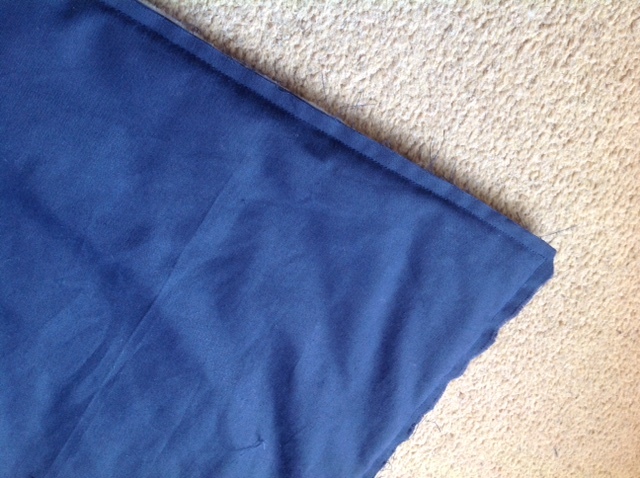 So, when sewing the squares together, some of the seams stretched where the interfacing didn’t go quite to the edge. Not what you want. I could get plenty more squares out of this babygro, but have left it at this for the time being. My ‘client’ doesn’t like too much repetition. Still on the high you get from a finished project – woohoo! Picking up from my last post, this is how I got to my finished quilt. I decided to just quilt the top of my quilt, and not the backing. 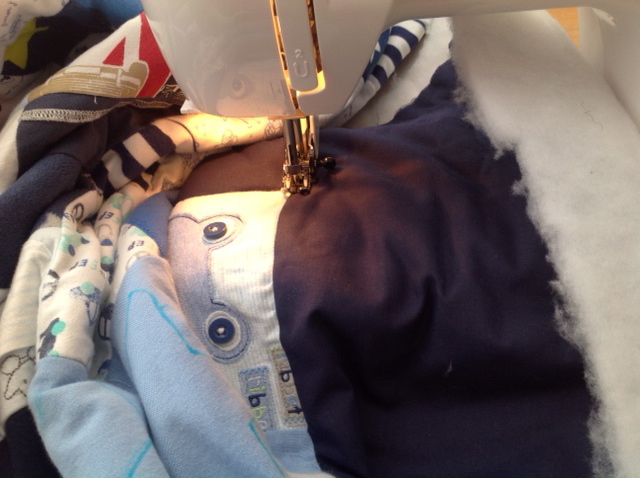 So Friday morning, as soon as my little man was napping, the sewing machine was out. I ‘stitched in the ditch’ round the edge of the border, where it bordered the patchwork. I need much more practice stitching in the ditch. I’m still very much straddling it at times. 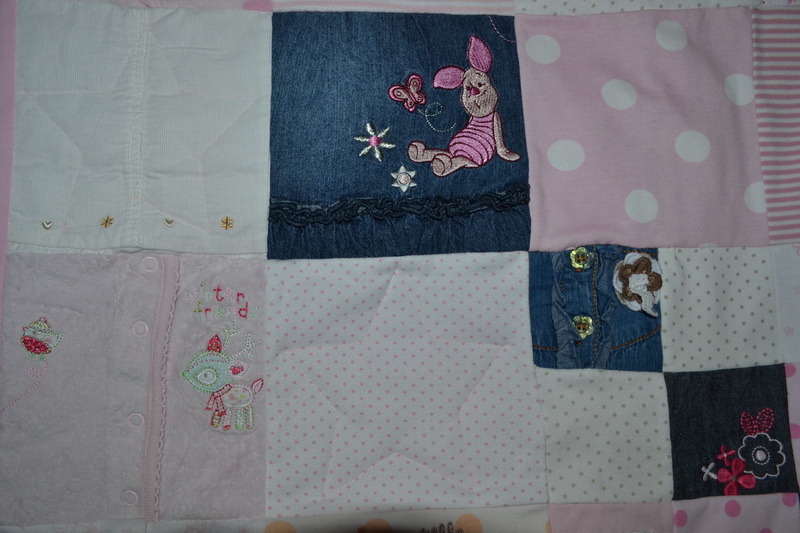 And then I quilted star shapes on to the plain squares. Squared up the quilt top and wadding. Saturday morning, another nap time. I pinned on the backing. Then hubby took little man out for a walk so I could finish off. 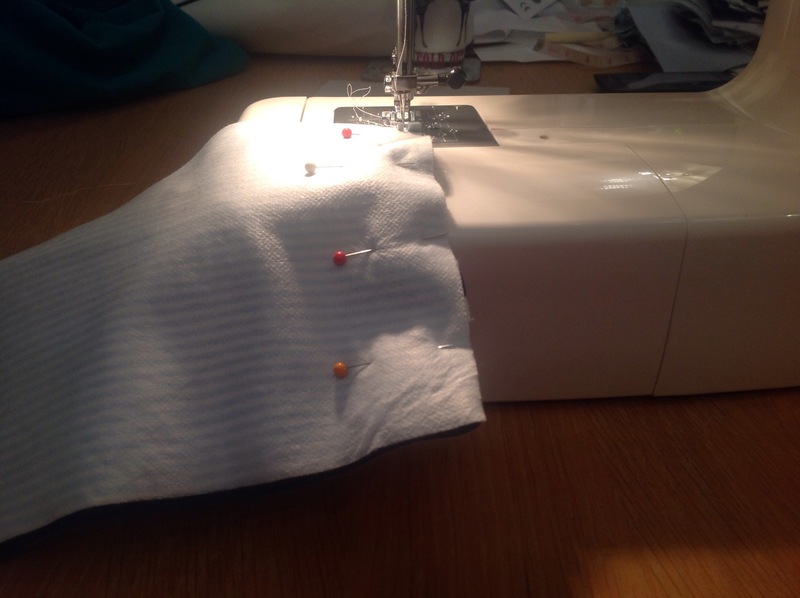 Sewed a 1/4 in seam round the edge, leaving about 12″ open at the bottom for turning out. Cut the corners and turned out, hoping for the best. Then all that was left to do was to close the opening with a slip stitch. Not easy for me as I’m ridiculously bad at slip stitch. 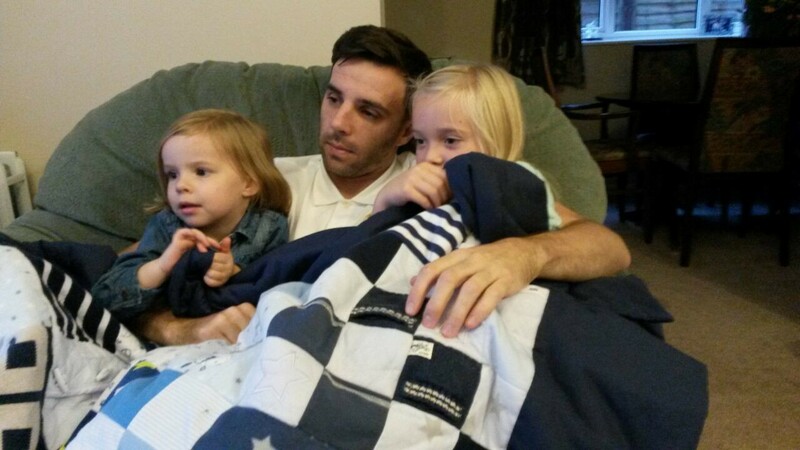 Ideal opportunity to catch up on the Children in Need Sewing Bee. Then it was into the washing machine on a hand wash setting followed by a gentle spin. 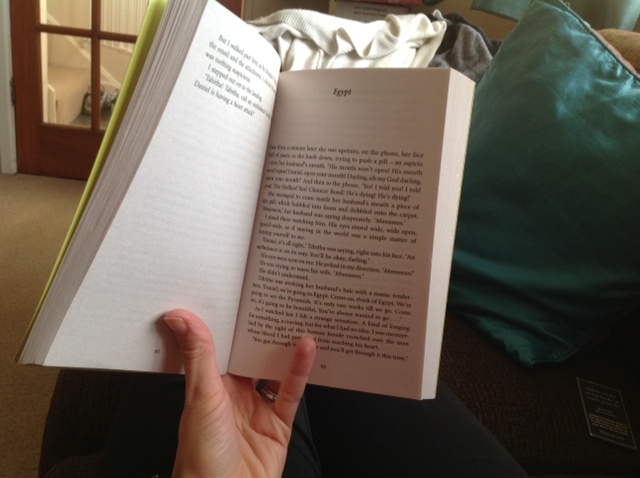 Little man was asleep again at this point, so I rewarded myself by sitting in the sun and reading my book. 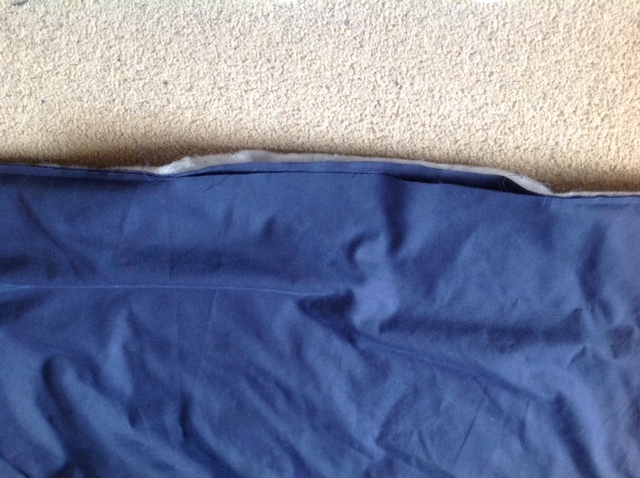 One of the seams had come apart ever so slightly and my rubbish slip-stitching looked awful, so that had to be done again. On the plus side, I got to catch up on more tv, watching Strictly from the night before. I was determined to have it finished Sunday morning, ready to hand over on Sunday afternoon. Mission accomplished. I even had time to get out our posh camera to take some photos of it. And here is the blanket, being enjoyed later that afternoon. Makes me feel all warm and fuzzy inside! 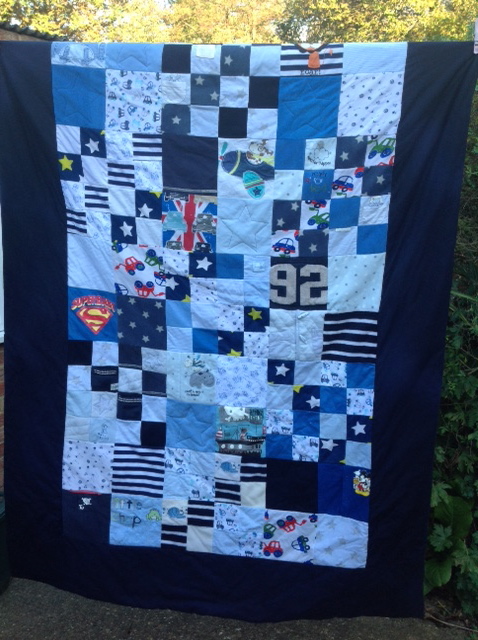 While I’m enjoying the comedown from finishing this memory quilt, I’m also getting itchy fingers to get onto the next one. 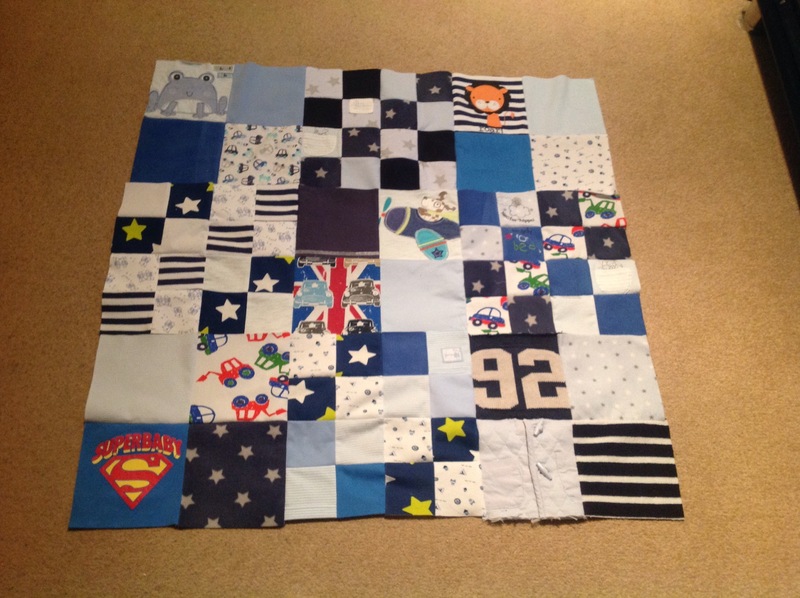 Even better, it’s a girly one for the big sister of this little boy. I find girls clothes so much nicer. 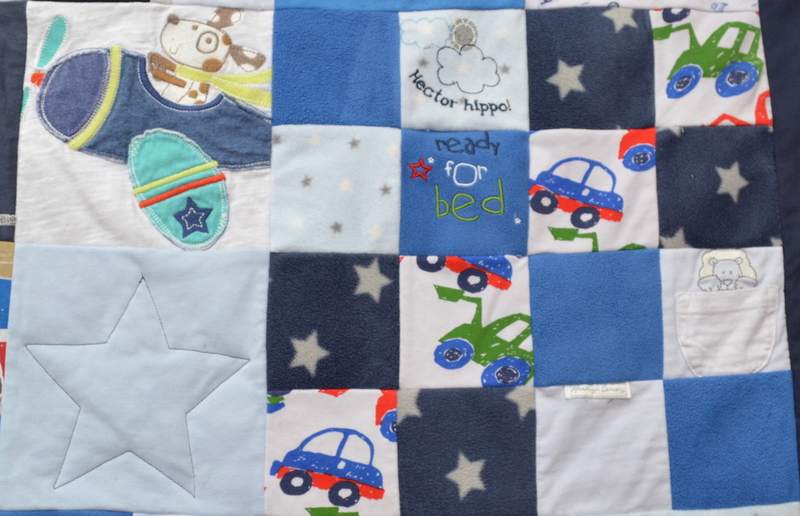 I’ve also had some orders come in off the back of this one so my (imaginary) order book now contains three more quilts/blankets, a Christmas stocking (made from last year’s Christmas outfit), matching cushions for my first two memory quilts, a memory bear and, finally, a teepee! Think I could be quite busy over the coming months! I’m hoping the next one will be a lot quicker, now that I know what I’m doing. In theory. 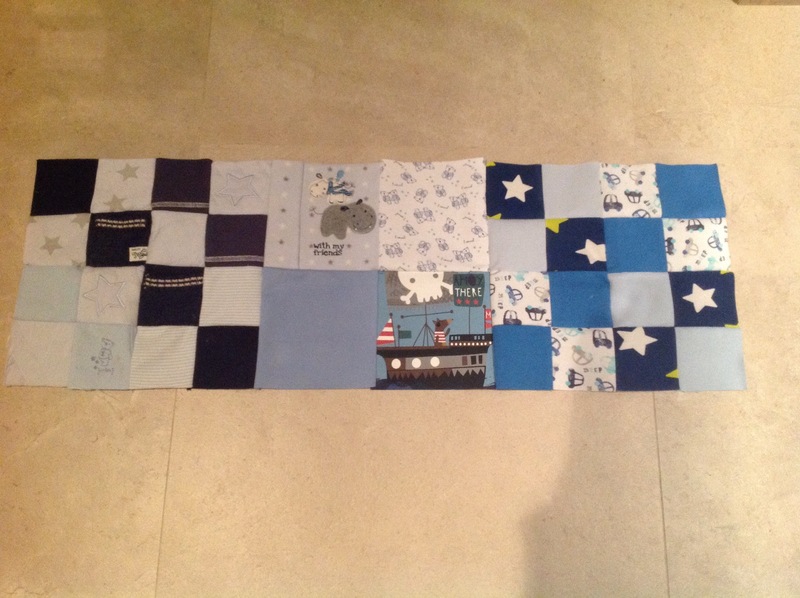 Behind my self-imposed schedule, as usual, but I’m pleased to say that I’ve finished sewing the top of the memory quilt. On Friday morning, I completed my first row. 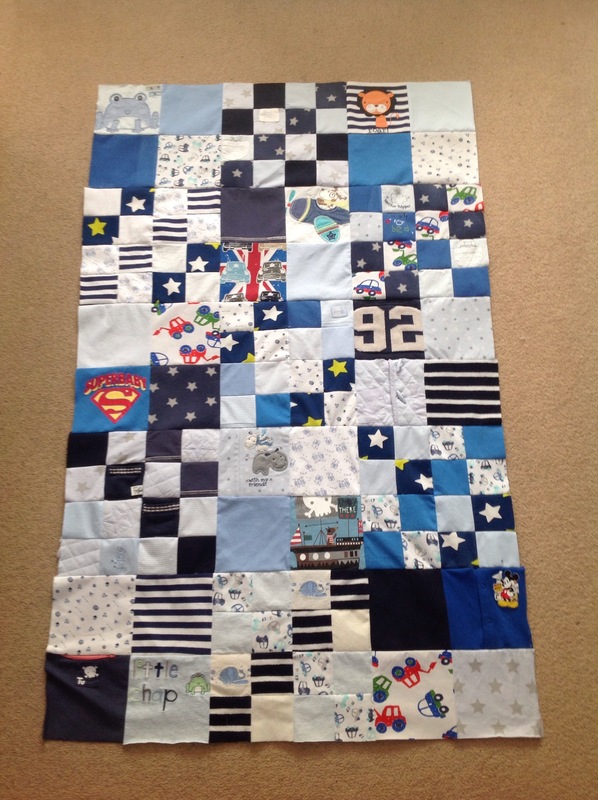 Which was actually two rows sewn together. 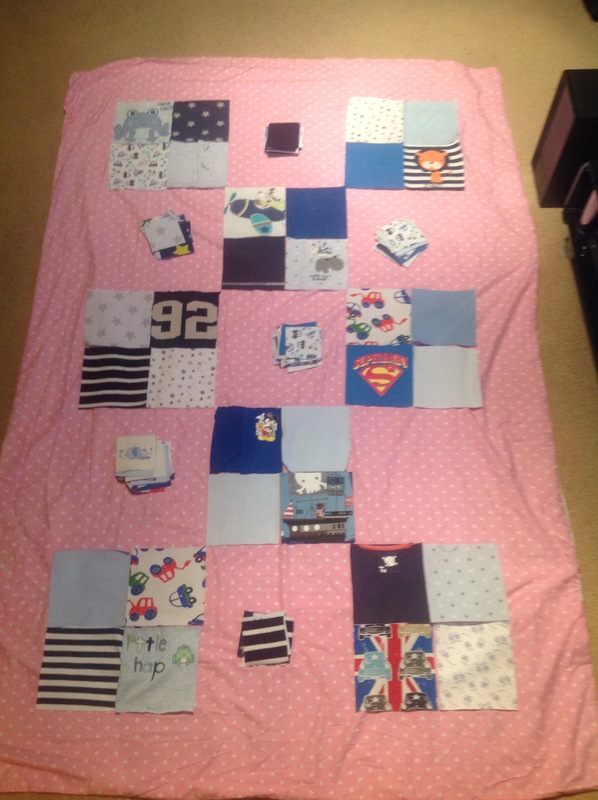 I’ve been sewing the squares in blocks of 4s for the bigger (6×6) squares and blocks of 16s for the smaller (3×3) squares. Which actually equates to two rows at a time. In the evening, and onto a row which consisted of a lot of little squares, I was close to throwing the sewing machine out the window whilst I struggled to align the joins of the little squares. Some I had to redo at least three times. Not my best Friday night ever. Anyway, here’s row 1. On Saturday, desperate for time saving methods, I started chain sewing the little squares. Rather than cut the thread each time I’d sewed two squares together, I just chucked another pair under the needle, leaving a little gap between the pairs. Can you see the chain? By the end of Sunday, I’d sewn another two rows of two. So six rows down, four to go. Not where I’d hoped to be, but I didn’t get the me-time I was hoping for, which meant crafting took a backseat. Here’s the six rows together. 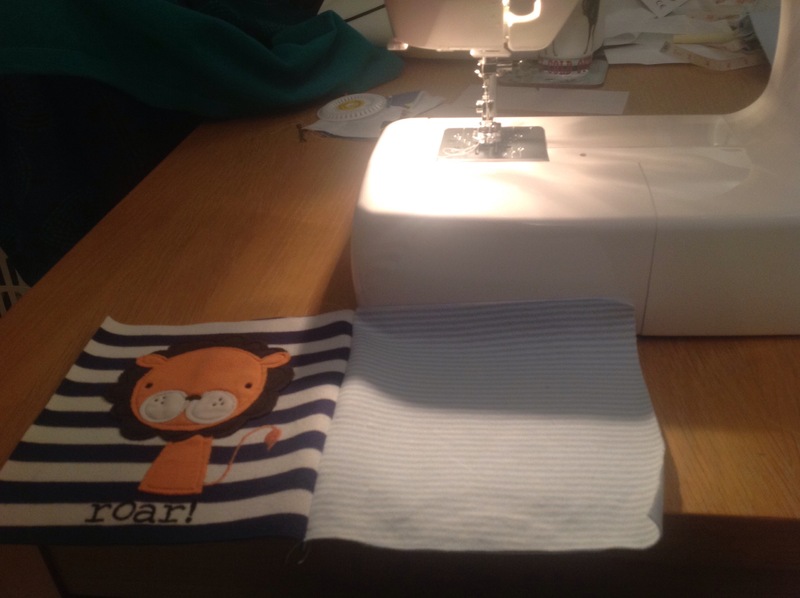 Monday night, another extension, my plan was to get it all sewn that night. Nope! Poorly baby. Penultimate row of two done. Tuesday morning, back on it. Last row of two finished. Tuesday afternoon, thanks to my little man helpfully having a good nap, I trimmed the rows so they were all the same width and sewed them all together. Voila! 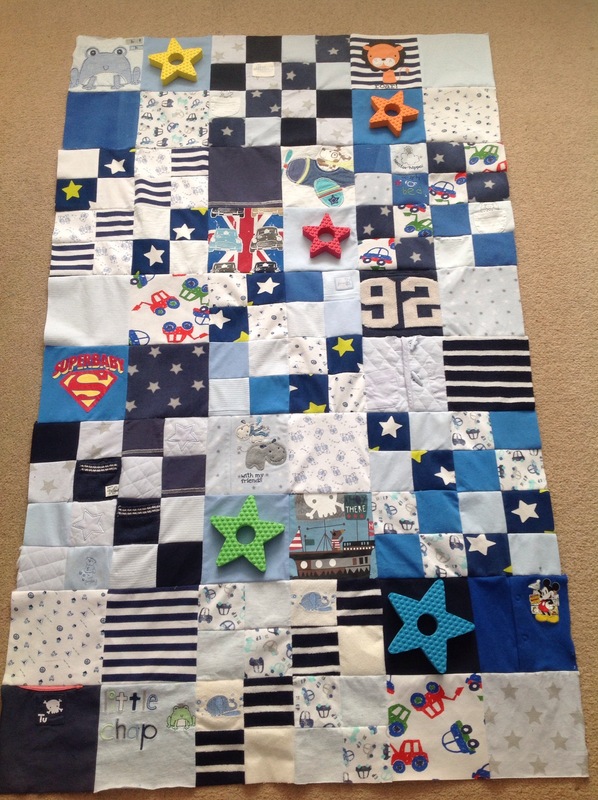 I suggested to the friend who is paying me to make this blanket that I quilt stars on some of the plain squares. As demonstrated by my son’s bath toys! Good idea, hey? She agreed. Having ordered some wadding from America which was not the twin size I ordered, my next lot arrived which was, thankfully, the right size. Incidentally, I contacted the American company who supplied the first lot of wadding and it turns out it’s a problem with Amazon. 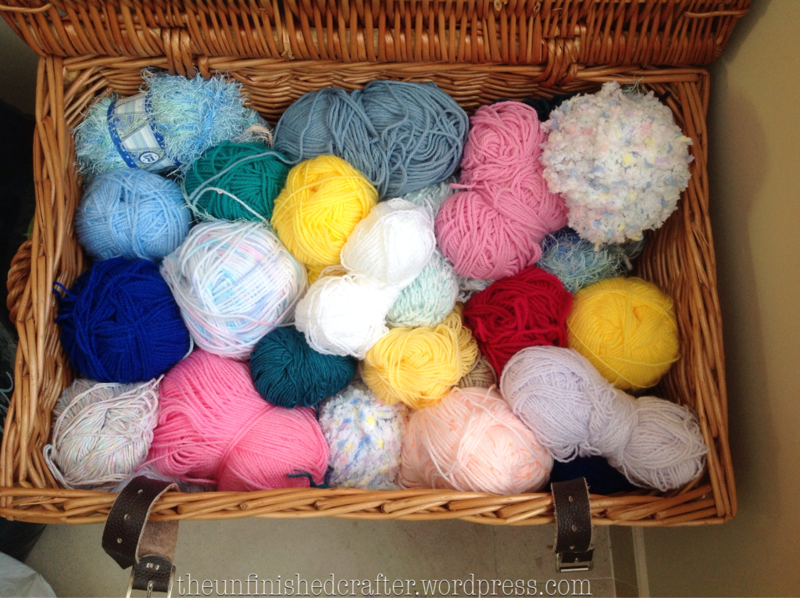 They’ve refunded me and I have two lots of free wadding to use on future projects … Result! So next up, I need to order the backing. I need three metres. Which is proving expensive. So, my cost-cutting solution is to buy a single bedsheet or two and use that instead. Watch this space, but not for a week or so. In the meantime, I’ll be busy with little man’s 1st birthday celebrations. Gulp. Sewing of the memory quilt has begun! Things should speed up from hereon in. She says hopefully. I’m using the pink single duvet as a side guide. Clearly, it doesn’t go. 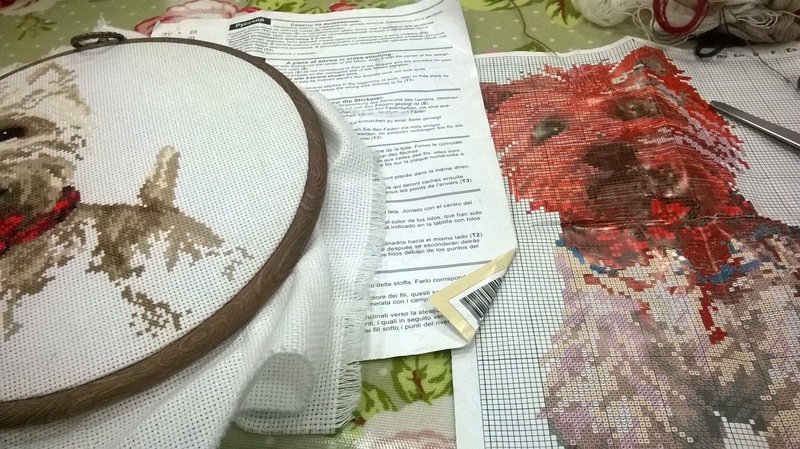 I was struggling with how to use the smaller squares to fill in the gaps. Use lots of the same like this? Or mix it up a bit, like this? Having consulted my crafty friends/gurus, I opted for the latter. The next challenge was how to get it all upstairs onto the spare bed, without messing it all up. The problem with a crawling baby roaming around is that I can’t leave it out during the day, so end up having to pack it all up each night. So I thought the spare bed would be a good new home for it. Anyway, I digress. I seized upon the idea that I might be able to roll the duvet cover up, row by row. Worth a try rather than having to transport all the squares upstairs and then reassemble. Amazingly, it worked! I felt like I’d won the lottery. Time saved, woohoo! I was going to have an early night tonight, but then Mr UnfinishedCrafter informed me that he had booked the tv to play on the Playstation. 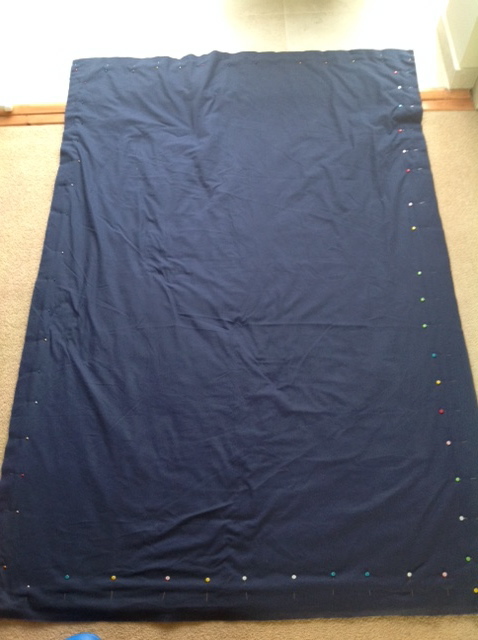 So, instead, I’ve pinned my first row, dusted off the sewing machine and started the sewing. Hurrah. I’ve done the first block and then hung up my sewing hat til tomorrow.